I have a static front page, that i want to add sidebars to. I need to be able to change the sidebars, frequently. I would like to have a blog page, maybe in the footers or even sidebars. Not opposed to being at the bottom of the page either. I just can’t seem to figure out how to do either of those. Also, some pages are full width and others are not. i would like all to be full width. Any reason why some are and others aren’t? How can I fix that? On your pages, in the Attributes module at right, you can choose either the default template (with sidebar) or the full-width template (no sidebar). Check your pages in the page editor and correct the template assignments to get you what you are looking for. The static front page template for the home page, does not have a sidebar. To do that, you would need to create a Child Theme and then add the PHP scripting to generate the sidebars on that page. It would require a good bit of restyling to add one, or two sidebars to Dara’s static front page. The content area in between two sidebars would be quite narrow unless you made the sidebars very narrow. You would want to create and use new CSS classes for the sidebars on the front page so that you could use widths that would not compromise your content. Dara already has the main coding for one sidebar, but to have a second, you would need to register a new sidebar widget area and then add that to the static front page. The changes you are wanting to make are considerable, and pretty involved. It may best, if you are not versant in PHP scripting, to post at jobs.wordpress.net and see if you can find someone who will help you with this for a reasonable price. I had the same request recently. You will find the solution in this Thread. I don’t have an attribute module. If you do not, scroll up to the top of the editor page and at top right click on the Screen Options tab and check Page Attributes. 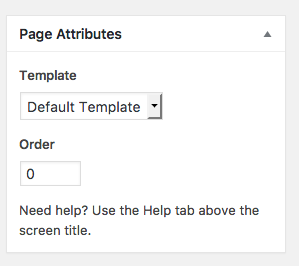 Once you have it activated, on the Template dropdown, select Default Template. The topic ‘Static Front Page and Sidebars’ is closed to new replies.